- Stable are characteristic : Large capacity welding transformer are designed with a no-load voltage capacity, providing extremely stable arc over the full welding current range. - Smooth welding current regulation : The welding current is continuously adjusted with the Moving-core handle. - Reliable outer case structure : The unit is made from a heat resistant design, with a naturally ventilated cooling system and a reliable outer case. - Easy movement : The eye bolts on the top and the wheels under the main body are attached so the machine can easily be moved. - Minimum power loss : The special design of the moving-core transformer structure reduces electrical power loss. - Highly reliable machine construction : We use a heavy duty, large capacity air cooled transformer for a reliable machine construction. The transformer coils are of a large capacity, air cooled design with band coil windings. The coils have class H insulation and are capable of withstanding temperatures as high as 200ºC. 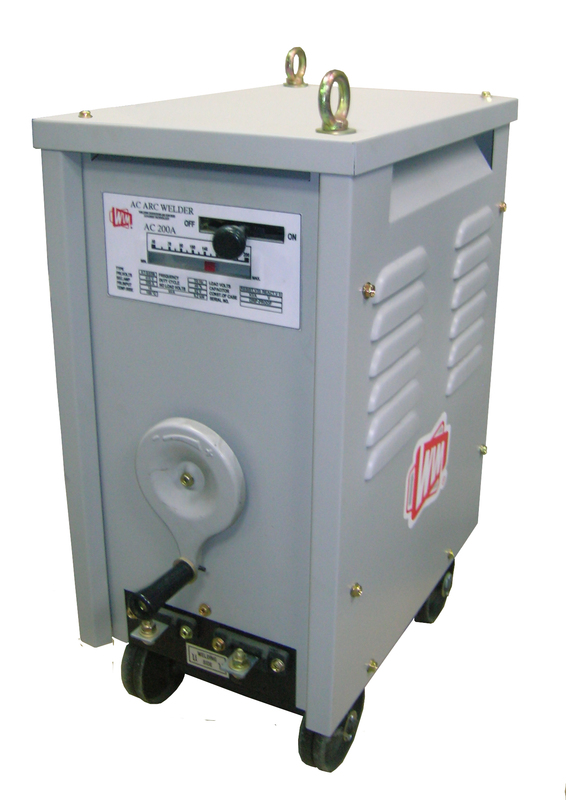 The transformer with a welded-joint core structure is installed in a steel case. The unit is reliable, even for heavy duty welding jobs. - Design safety : The input cable connection terminal block is installed in the outer case. No tools are needed to connect the output cables to the terminals. There is a steel net plate located at the bottom of the casing for safety purpose.